This is a list of useful movie websites to help guide you to the best film content on the web. Back in August 2006 I created a list of what I thought were the 10 most useful movie websites but I felt a fresher and more comprehensive one was needed (which is why it is the 2.0 version). So, the following is a collection of sites related to the world of film broken down into these categories: essential sites, news, blogs, critics, DVDs and podcasts. If you look on the sidebar to the right you’ll see links to a lot of these sites but I thought I’d expand it and explain why they are worth bookmarking. Part of the aim here is also to spread the word about quality film sites, so if you want to post this to Digg or another social news site then just use the buttons at the bottom of this post. I’m sure there are more links out there worthy of inclusion in a future list, so if you have any suggestions email me or leave a comment below. These are sites that I would consider essential bookmarks. They range from some of the most popular film sites on the web to the more obscure, but all are useful at helping you find the movie information you want. Box Office Mojo: The best site for finding out how films are doing at the box office. Criterion Collection: The pioneering US DVD label is an essential visit for anyone interested in re-issues of important classic and contemporary films. Digg / Movies: Despite being just 3½ years old this social news site has become an extremely useful way of gauging what users find interesting and the movies section is always worth a look. Google Movies / Showtimes: A simple but hidden gem from Google which allows you to type in your postcode and get local movie showtimes. IMDb: Perhaps the most useful movie site of all, The Internet Movie Database has an extraordinary array of information on films, directors, actors and a good deal else besides. Metacritic: My favourite review aggregator, this lists the critical reaction to the latest movies and assigns them an average score out of 100. It also provides handy links to the reviews themselves. Criticker: A website where you can rate films and match your film taste with others using a Taste Compatibility Index. Movie City News: An excellent one stop shop for film news edited by David Poland. It has regular links to all the latest news stories and a series of blogs that are connected to the site. Movie Review Query Engine: A fine database of reviews, which also features a handy release schedule and links to showtimes in the US, Canada and the UK (just type in your postcode). Rotten Tomatoes: Although I prefer Metacritic, this review hub is still very useful at gauging critical reaction to movies old and new. Screen Online: This comprehensive database from the British Film Institute is an essential research tool for anyone interested in the history of British TV or cinema. Soundtrack Net: The essential site for anyone interested in soundtracks, with reviews, interviews with composers, features on different scores and even an incredibly detailed database of music used in trailers. Star Links: A very handy database from the University of Virginia (the folks that gave us the Oracle of Bacon) that connects actors through the films they have appeared in. YouTube: The popular video site has become a great way for viewing trailers and all manner of obscure movie related content like Orson Welles doing a peas advert, Jaws reworked as a comedy, Hitler ranting about the downfall of HD-DVD, a clever countdown from 100 to 1 using different movie clips or a montage of the films of Paul Thomas Anderson. Wikipedia / Film Portal: The online encyclopedia has a wealth of useful movie information. The entries on particular films can be highly informative (e.g. Blade Runner, Ran, Halloween, Witchfinder General, E.T. and Zodiac) and provide useful context. If you ever wanted to know about such diverse things as the WGA screenwriting credit system, Panavision, what a Gaffer does on a film set and the little known TV movie Mazes and Monsters, then Wikipedia has entries for them all. Keep an eye on the featured media articles section as that is where the best film entries pop up. The following section is a little broad but it centres on more general sites that cover the world of film. 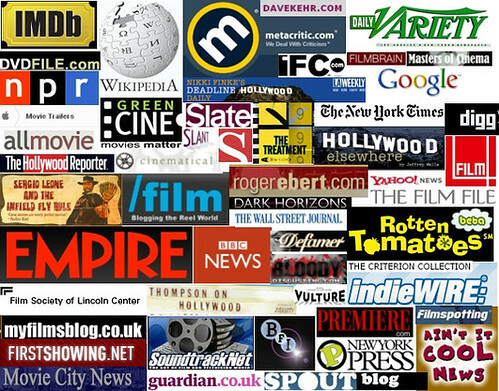 Some are established news organisations whilst others are purely online, but all are useful sources of information on the latest film stories. Aint It Cool News: One of the first movie websites to get worldwide attention in the late 90s after creator Harry Knowles spilled the beans on how bad Batman and Robin was, AICN remains an important place for checking out the latest news, rumours and fan reaction even though the design hasn’t changed much during the years. AP News / Entertainment: The famous US news agency is always worth checking for stories related to the film industry. AV Club: The entertainment branch of The Onion features a lot of interesting reviews and features on films and directors outside the mainstream, plus Scott Tobias and Nathan Rabin are critics always worth reading. BBC News / Entertainment: One of the British taxpayer’s (or to be more accurate licence fee payer’s) gift to the world is the web’s best and most comprehensive news site. As such, the entertainment section is essential. Bloody-Disgusting: For horror fans this a very useful place to get the latest news and views on the genre. C.H.U.D. : Cinematic Happenings Under Development plays in the same ballpark as AICN with a slant towards genre side of things but is worth checking out for the news, features and interviews. Coming Soon: Another site that can be useful for news and previews of mainstream releases. Dark Horizons: An Australian based site that started out specialising in sci-fi but now is a valuable resource for all kinds of mainstream films. Devil Ducky: A useful hub for checking out the latest viral videos. Entertainment Weekly: The magazine founded by Jeff Jarvis of Buzzmachine back in 1990 became famous for issuing grades to movies and still remains a useful site for mainstream Hollywood films with people like Steven Spielberg giving them exclusive interviews and writers like Stephen King and Diablo Cody writing articles for them. Film Comment: The bimonthly film journal published by the Film Society of Lincoln Center has a website that is worth reading for those interested in the more highbrow films. Although only a selection of articles are posted online their intelligence and rigour is always a pleasure to read. Filmmaker Magazine: A quarterly publication covering the indie world is useful for a different perspective and those hidden films with smaller budgets but greater ambitions. It even features articles from the likes of director David Gordon Green, so is always worth a look. Guardian Film: The UK newspaper that probably best understands the dynamics of print and online has an excellent film section filled with solid features whilst critics like Philip French, Mark Kermode and John Patterson are always worth reading. The comments sections on their blog can be illuminating, especially when film companies and PRs are caught out planting positive reviews of terrible British films. Hollywood Wiretap: The look and feel of this news site make it appear like a film version of the Drudge Report but it is a handy gauge of film news from a variety of sources. Film4: The UK’s best film channel has a comprehensive website filled with reviews, interviews and features. Pus, if you live here then check out their listings as they have a great mix of mainstream and cult movies showing throughout the week. indieWIRE: An excellent hub for news on the independent film world with excellent coverage of festivals like Sundance and interviews with established and up and coming filmmakers. JoBlo’s Movie Emporium: Another website that’s been around quite a while with a nice mixtures of news, reviews and thoughts on films across the board – even Steven Spielberg is a fan. Little White Lies: A classy UK based film magazine that also has a presence on the web. New York Times / Movies: The pre-eminent US newspaper maybe cutting jobs but lets hope that doesn’t affect their first rate movies section. The features may sometimes be a day or two behind the best movie blogs, but generally speaking the reporting and writing is of the high standards you would expect of the Grey Lady. Critics such as Manohla Dargis and A.O. Scott are part of any discerning film fans’ required reading. Premiere: Although the magazine may no longer exist, the online version survived with Glenn Kenny providing the news and insight. Well, that was until a couple of days ago when Glenn was let go. He has a new blog called Some Came Running. Sight and Sound: The UK’s best highbrow film magazine is frustrating in what it chooses to put up on the web (it saves some of the juicier features for the print edition) but there is no doubting the quality of the contributors whose reviews and features are usually in-depth and rich food for the cinephile mind. Slant Magazine / Film: This is a well written, intelligent site and in critic Ed Gonzalez they have a writer who is always worth reading even though his views tend towards the arch and contrarian. Their end of year lists are required reading. Telegraph / Film: Although it suffers in comparison to The Guardian (its UK newspaper rival) the film section of the Telegraph is worth a look now and then for interviews, profiles and features. The Times / Film: Another UK newspaper that often has some good features, especially around the London Film Festival (which it sponsors) and reviews from the likes of James Christopher, Cosmo Landesman and Wendy Ide. Cinematheque: A useful hub for finding out more about individual filmmakers like Woody Allen, Ingmar Bergman or Michelangelo Antonioni. The Hollywood Reporter: Although it doesn’t have the influence or prestige of its rival Variety, this trade paper often contains stories of interest, whether it is the announcement of a new production or recent box office grosses. The New Yorker / The Film File: The New York magazine has a deserved reputation for quality writing and that comes across in many of the movie features or profiles it does. The review section was made famous by Pauline Kael and now Anthony Lane and David Denby carry her critical torch with witty (and often snooty) putdowns of the latest cinema amidst the few things they enjoy. They Shoot Pictures Don’t They? : A superb gateway to some enlightening movie content be it a 1000 great movies you should see or posts from other sites like GreenCine. Variety: The trade bible is sometimes accused of be a little too close to the industry it covers (see the WGA strike coverage or that infamous Charlie’s Angel’s 2 review) and editor Peter Bart may have doubts about blogs, but it is still essential reading for anyone with the slightest interest in Hollywood. Almost every aspect of the entertainment business is covered in depth and after they sensibly abolished their pay wall last year, it has become an invaluable resource. Yahoo News / Movies: With all their recent troubles evading the clutches of Microsoft, Yahoo’s movie section resembles the rest of the company – i.e. stuck in 1998. But new trailers (like Indy 4) often show first here and the photos of premieres are quite good if you are into that kind of thing. Blogs have grown rapidly in the last four years, allowing professional journalists and keen movie lovers to publish their thoughts online in a structured format. Some of these belong to established news organisations, others are independent – but all are worth reading if you want regular doses of movie opinion and insight. /Film: Peter Sciretta edits this blog that has come on leaps and bounds in the last couple of years. The focus is on mainstream movies, but the stories here are a useful snapshot of what is going on in the wider movie blogosphere from posts about Indy 4 to coverage from Sundance. Awards Daily: Sasha Stone is one of the elite awards season bloggers, which means she covers the road to the Oscars with a passion and detail that is rare indeed. If you have any interest in the raft of awards that lead to Oscar, such as the Golden Globes, SAG awards and BAFTAs, then this is the place to visit. Salon / Movies: Although it still has that annoying ad at the beginning of the site (can’t they find a new commercial model?) Salon is still a home for perceptive and lucid journalism. Writers like Stephanie Zacharek and Andrew O’Hehir provide a distinctive take on films and Andy Klein’s 2001 piece on Memento is one of the best things I’ve read about that film. Cinedelica: A range of different cult movies are covered in this fine UK based site, which features competitions and coverage of films like The Frightened Woman and Vault of Horror. Cinematical: One of the first movie blogs to really make a mark, it is still a very useful place to catch up with news, features, reviews and interviews from a range of writers including Monika Bartyzel, Erik Davis, Scott Weinberg and James Rocchi. It has a sister site called Cinematical Indie that is also worth bookmarking. Cinephiliac: The personal website of New York based film writer Aaron Hillis – a contributor to The Village Voice, Premiere, IFC News, Moviefone, and The Reeler – which has links to his work and a rather funky design. Dave Kehr: You may know Dave as the guy who reviews DVDs for the New York Times but his own blog is also worth a look for his intelligent take on a variety of films and directors. If – like me – you are excited by the prospect of Criterion releasing The Third Man and The 400 Blows on Blu-ray – then this is the place to find out. David Bordwell: The Jacques Deloux Professor of Film Studies at the Univeristy of Wisconsin-Madison is also a prolific blogger. Useful for anyone interested in the history of cinema and how it relates to what you see on the big and small screen. David Carr / New York Times: Also known as ‘The Bagger’, David Carr has become something of a delightful paradox – a hip ‘new media’ blogger at the most prestigious ‘old media’ outlet in America. His video blogs from Times Square during the awards season are smart, funny and always end with the strange payoff line: ‘It’s called Times Square …for a reason’. His writing is also a pleasure to read (check out his Oscar debate with fellow NY Times writer A.O. Scott) and even though Paul Thomas Anderson has (perhaps jokingly) quizzed his knowledge of films, I’m a fan. Deadline Hollywood Daily: Nikki Finke is a journalist almost born for the medium of blogging – tough, smart, opinionated and armed with an impressive array of Hollywood sources. She puts up the latest Hollywood stories ranging from box office grosses to why the former head of New Line Cinema is not to her liking. During last year’s WGA strike her reporting of the bitter dispute between the studios and the writer’s union was eye opening and boosted her profile even further. Defamer: The Hollywood branch of Nick Denton’s Gawker blog empire is a barrage of no holds barred gossip. Sometimes cruel, sometimes amusing it can also be a useful window into the wackier aspects of the Hollywood machine. 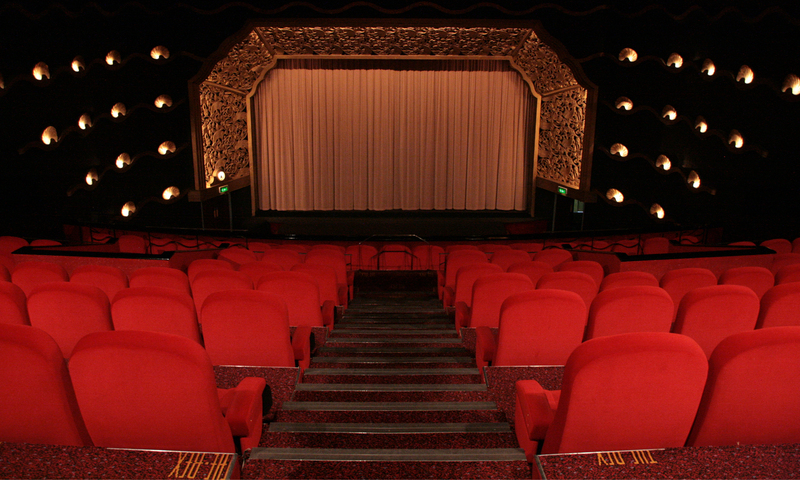 GreenCine Daily: One of the best and most comprehensive film blogs on the web. It is a fantastic resource for any film fan with regular posts on a wide range of movies, although it skews towards the high brow. Filmbrain: A New York based blog worth checking out for their take on current film issues, like the now-old-but-still-kind-of-relevant critics vs bloggers debate and an addictive screen capture quiz. First Showing: The gang at First Showing submit news items that regularly make the front page of Digg and their blog is a good mix of reviews, news, rumours and interviews. Hollywood Elsewhere: Jeffrey Wells is one of the most prolific bloggers anywhere, with regular daily updates on all manner of film related news. The comments section is usually an interesting place, especially with the likes of producer Don Murphy and director George Hickenlooper posting there from time to time. IFC Blog: The blog of the Independent Film Channel is updated daily and covers a wider range of movies than you might think. In Contention: Another blog that covers the awards season with an impressive depth and zeal. Edited by Kristopher Tapley (who also writes for Variety’s Red Carpet District) is usually full of intelligent analysis and interesting features like this one on the best shots of 2007. Moving Picture Blog: You might know Joe Leydon form his role as a critic for Variety (or you may even be one of his students at the University of Houston) but his blog has a nice range to it, covering mainstream movies and more artistic fare with a pleasing sense of fair-mindedness. Masters of Cinema: A feast for any cinephile this site has a highly impressive stream of information on classic films and links to where you can get them on DVD. Movie Marketing Madness: A blog that explores how films are marketed, with some interesting insights on how this part of the Hollywood machine works. Check out their take on how Speed Racer was marketed by Warner Bros.
My Films Blog: A UK based blog written by a collective of film writers including Angie Errigo and Charles Gant, it often has a useful breakdown of the UK box office as well as reviews of the latest films. Not Coming to a Theater Near You: Tasteful blog written edited by Rumsey Taylor, Leo Goldsmith, and Jenny Jediny that slants to the high brow end of the spectrum. Patrick Goldstein / LA Times: The LA Times film writer has regular opinion pieces that are worth checking out. Risky Biz Blog: The blog of trade journal The Hollywood Reporter, which is edited by Steven Zeitchikand features contributions for various other HR writers. Useful for industry analysis even if there isn’t much in the way of outbound links. Roger Ebert’s Journal: Although his official site has been going strong for years now, the famous critic for the Chicago Sun-Times has now started a blog in which he’s already written about fanzines begetting blogs and his early days as a teenage newshound. Scanners by Jim Emerson: Ebert’s colleague at the Sun Times is the founding editor-in-chief of RogerEbert.com and also runs his own blog which is another useful place to catch up with the latest news and opinion on movies. Sergio Leone and the Infield Fly Rule: As a devoted Leone fan, the title of this blog had me hooked from day one. But the great thing about the site – written by Dennis Cozzalio – is it’s unique voice and passion for cinema. For an explanation of the rather funky title check out this post. Spout Blog: This blog claims to be ‘daily coverage of what is truly interesting in the film world’ and it is just that. Lots of intelligent insight is served up daily by Karina Longsworth, Christopher Campbell and Paul Moore. The Envelope / LA Times: The awards section of LA’s daily newspaper might lack the detail of certain rivals but is usually a good place for more ‘establishment’ coverage of Oscar season with big name interviews and analysis. The Hot Blog by David Poland: David Poland is the editor of Movie City News and has been writing online since the late 90s at The Hot Button. His blog is filled with lots of smart, detailed insight into the latest releases, issues affecting the film industry and a good deal else besides. The House Next Door: A terrific place to catch up with all sorts of daily film content from around the web. The contributors and comments are often spot on although the recent departure of founder Matt Zoeller Seitz is a big blow – let’s hope he continues writing there in some capacity. The Playlist: Dedicated to ‘that sweet spot where music and movies meet’ this is a place where you can explore soundtracks and enjoy their amusing riffs on current film releases. The Screengrab: A blog with ‘news, gossip and comment for indie film addicts’, this also has a fine strand of unwatchable movies (e.g. Bolero) that you perversely want to see after reading about them here. Thompson on Hollywood: Variety’s Anne Thompson used to be at Risky Biz Blog but switched over to their trade paper rival and posts regularly on the industry with her customary insight and taste. Refreshingly for someone at an established media outlet she understands the virtues of blogs and how they are reshaping film coverage. Twitch: An excellent destination for anyone interested in Asian cinema. The role of the film critic is one that has come under some scrutiny in recent times with many getting laid off and some questioning their role in an age of blogs and sites like Rotten Tomatoes. What follows here are the film critics whose opinion and insight is valuable to anyone who cares about the medium. A.O. Scott / New York Times: Scott is always a thoughtful observer of the cinematic arts be it a blockbuster like Iron Man or an arthouse gem like Offside, even if he can sometimes be a little high minded about the role of the web in modern film criticism. Andrew O’Hehir / Salon: O’Hehir’s reviews and writings are perceptive whilst retaining an obvious enjoyment of watching movies (which can’t be said of all critics). Andrew Sarris / New York Observer: The distinguished veteran – and one of the leading proponent’s of the auteur theory – is still going strong and his experience over the years makes his contemporary reviews all the more interesting. Anthony Lane / The New Yorker: Although his reviews often read like elaborately constructed jokes designed to please cultural snobs on the Upper East Side, Lane remains a distinctive voice amongst the critical elite. Armond White / NY Press: White often comes across as a high priest of contrarianism, whose love of A.I., frequent positions against critical favourites like There Will Be Blood and bizarre views on ‘Internetters’ only make his writings a blast of fresh air. David Ansen / Newsweek: Although he announced earlier this year that he’ll be stepping down, Ansen brings a level headed eloquence to the movies he reviews weekly for the US news magazine. David Denby / The New Yorker: Anthony Lane’s colleague at the New Yorker, Denby brings a similar level of intelligence and wit to his writings on cinema. David Edelstein / New York Magazine: Formerly of Slate and the Village Voice, Edelstein usually brings an interesting angle to his reviews whether it is deconstructing the latest Judd Apatow produced comedy or praising Paranoid Park. Ed Gonzalez / Slant Magazine: Like Armond White, Gonzalez appears top relish in swimming against perceived critical wisdom but that is why he’s worth a look from time to time. J. Hoberman / Village Voice: The senior film editor for the Village Voice has a terrific grasp of film history, which makes his reviews amongst the most lucid and informed you can hope to read. James Berardinelli / Reelviews: One of the first film critics on the web I ever came across, James has been publishing reviews on his site since the mid 90s and has an enthusiasm for films that marks him out from his peers. Joe Morgenstern / Wall Street Journal: The Pulitzer Prize winning critic for the WSJ is always a beacon of intelligent taste – even when you find yourself disagreeing with his analysis. Kenneth Turan / LA Times: Although James Cameron once called for his impeachment over a barbed review of Titanic, Turan has a clear passion for movies that comes across in his thoughtful reviews for LA’s main paper. Manohla Dargis / New York Times: One of the most distinctive critical voices in mainstream US media, Dargis has a nice blend of intelligence and passion, whether it is praising Children of Men or slamming Jumper. Michael Phillips / Chicago Tribune: Solid reviews and blogging from Chicago – a city well served by its film critics. Peter Bradshaw / The Guardian: Since 1999 The Guardian’s chief film critic has been examining cinema releases with a pleasingly rigourous eye and his positive open-mindedness about the web is a nice change from some of his peers. Philip French / The Observer: My favourite critic based in the UK has seen over 14,000 films and brings a rare blend of erudition, fairness and enthusiasm to his weekly reviews for the Guardian’s sister Sunday paper. The recent BAFTA tribute to him was well deserved. Richard Corliss and Richard Schickel / Time: The two Richards who write for the US weekly magazine are both experienced and smart observers of the silver screen and if any articles hit that famous front cover – like the Munich piece in 2005 – then they are required reading. Roger Ebert / Chicago Sun-Times: The rightly celebrated Pulitzer prize winning critic is often known for his thumbs up/down approval of films, but his infectious enthusiasm, perceptive critiques, excellent books and wide-ranging taste make him one of the best in his field. Todd McCarthy / Variety: Many eyeballs in the industry are ready to scan what the trade bible’s chief reviewer will make of a big release. Not only can it set the tone for a film’s commercial and critical prospects, but Todd McCarthy is a shrewd observer of the whole package of a particular release, avoiding the academic posturing that can affect some critics. For those interested in finding films on DVD and what the latest releases are like then I would suggest the following. Amazon UK / US: The giant online retailer is still the place to search for and buy (or even sell) DVDs. They own the IMDb, so when you are browsing entries there look on the top right hand corner and you will see links to the film on DVD or the soundtrack. The user reviews can also be handy. DVD Beaver: An excellent place to check out the specs of the latest DVD releases – check out these screenshots of the Criterion release of Days of Heaven to see how useful the site can be. DVD File: A very solid and comprehensive site featuring news, reviews and technical explanations of the format. DVD Price Check: A good place to get price comparisons on the latest DVDs from the various regions. DVD Spin Doctor: Glen Abel‘s blog about the latest DVD news and releases is a very useful source of news and opinion. DVD Times: Posssibly my favourite DVD site, with a comprehensive list of release dates, news, reviews and images. The Easter Egg Archive: Useful site for finding hidden bonus features (also known as Easter Eggs) on DVDs. Ebay US / UK: If you can’t find a DVD at a retail outlet, have a browse on the auction giant to see if a user is selling an old copy. Play: A consistently excellent place for good deals on DVDs, as well as CDs and other products. Very useful for getting a bargain on a DVD box set. A number of fine film related podcasts are now available for free and you can subscribe to them via iTunes, RSS feed or via direct MP3 download. BBC / The Film Programme: Radio 4’s flagship film show skews a little highbrow, but host Francine Stock is a smart host and it features regular interviews from a variety of filmmakers and critics. BBC / Mark Kermode’s Film Reviews: The last hour of Simon Mayo’s 5 Live show on a Friday is devoted to the opinions of Dr. Mark Kermode on the latest cinema releases. Intelligent analysis is coupled with witty putdowns of things he doesn’t like (such as Keira Knightley and the Pirates of the Caribbean movies). Plus, he was the guy who interviewed Werner Herzog when he got shot at by an air rifle. Creative Screenwriting Magazine: Jeff Goldsmith is the senior editor of Creative Screenwriting magazine and regularly puts up podcasts of Q&A sessions he holds with established screenwriters. The range is very impressive with the likes of Ronald Harwood, John Logan and David Chase being on in recent weeks. Jeff also has a blog where you an download MP3s of the latest episodes. KCRW / The Business: Hosted by Claude Brodesser-Akner, this is a weekly show that examines the business side of Hollywood with perceptive interviews and a wry outlook on different aspects of the industry. KCRW / The Treatment: Elvis Mitchell hosts this weekly interview show in which a varity of guests come in for an in-depth 30 minute discussion about their work, ranging from directors like Jon Favreau and Paul Thomas Anderson to TV hosts like James Lipton. NPR Movies: A superb weekly collection of the best film content on NPR with reviews, interviews and news stories. Film Weekly: Jason Solomons hosts The Observer’s weekly film podcast and it features his thoughts on the latest UK releases as well as interviews with actors and filmmakers. Filmspotting: Adam Kempenaar and Matty Robinson offer a smart weekly look at the new US releases, gauge listener feedback and discuss films from the past. Movie Rush: A neat UK video podcast from Film4 about the latest releases. The MovieMail Filmcast: Graeme Hobbs gives thoughtful and intelligent introductions to arthouse films available on DVD. Triggerstreet TV: Dana Brunetti and Evan Astrowsky host a short but entertaining video podcast discussing the latest issues in Hollywood – whether its bragging about the grosses of 21 (which Dana produced) or the threat of another strike. So that wraps this list up. As I said before, if you have any good sites worthy of inclusion then leave them in the comments below or email me. Excellent job. I have no idea how long you took to put this very impressive list together, but please consider the effort highly appreciated. Thanks for the inclusion of the TriggerStreet TV Podcast! No problem Dana – keep up the good work! Ambrose: Thank you very much for your inclusion of my blog on this impressive list! And for incorporating the header amongst all that fine company in the picture too. Your words and support are much appreciated, as is the effort you took to produce this list, which is extremely valuable to me. May I suggest the inclusion of Jim Emerson’s Scanners in any updated versions? I’m planning on doing something Bollywood related in the near future, so keep a look out for that. Hiya- this is a great list, you should also check out Criticker.com great for discovering movies and comparing your move taste with others. The move movies you rank the better it works. Hey, I would just like to add a critic that I think you’ve overlooked. Eric Armstrong is the head critic for The Moving Arts Film Journal (http://themovingarts.com) and is easily the best critic I’ve ever read. Very insightful, creative and usually dead on. Great list. Another one to check out if you like fun movie battles where two films are pitted against each other is Ross v Ross – http://www.rossvross.com – two guys called Ross argue which one is best and readers vote based on their rantings – is good fun.